In the county, the population was spread out with 26.20% under the age of 18, 7.90% from 18 to 24, 27.70% from 25 to 44, 24.70% from 45 to 64, and 13.60% who were 65 years of age or older. The median age was 37 years. For every 100 females, there were 95.40 males. For every 100 females age 18 and over, there were 93.20 males. ^ "Cleveland County". The Encyclopedia of Arkansas History & Culture. Retrieved August 21, 2012. ^ 2011 Boundary and Annexation Survey (BAS): Cleveland County, AR (PDF) (Map). U. S. Census Bureau. Archived from the original (PDF) on 2012-10-19. Retrieved 2011-08-14. 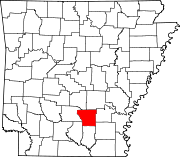 ^ "SCHOOL DISTRICT REFERENCE MAP (2010 CENSUS): Cleveland County, AR." U.S. Census Bureau. Retrieved on October 15, 2017. ^ "Arkansas Governor Harvey Parnell". National Governors Association. Retrieved August 21, 2012. This page was last edited on 27 August 2018, at 19:21 (UTC).